The New Orleans cruise terminals at the Julia Street Wharf have been upgraded and a new and larger cruise terminal is open at the adjacent Erato Street wharf. The terminal is designed to accommodate the largest cruise ships. 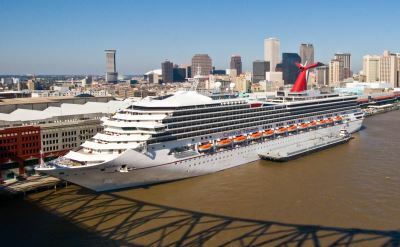 The New Orleans cruise port is located within walking distance of the Arts District and the French Quarter. It is next to the RiverWalk Shopping Mall, so you can shop until it's time to board the ship. The New Orleans cruise terminal complex is also on the RiverFront streetcar line. Learn more about things to do in New Orleans. Staying overnight before or after a cruise is a good idea. 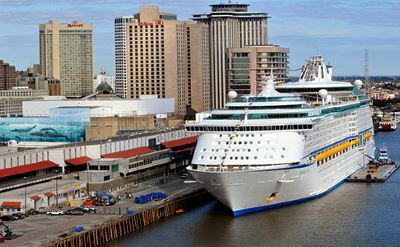 There are many hotels near the New Orleans cruise terminal. The official secure long-term New Orleans cruise parking is located in garages at the terminals. Please follow the link for more information. The official parking facilities at the cruise terminal are the most convenient. For Julia Street cruise terminal parking, first go to the drop-off area where Seacaps will assist you with your luggage. Then you will be directed to the parking lot. The Erato Street cruise terminal includes a four-story parking garage to handle over a 1,000 vehicles. A map of the cruise terminal location at 1100 Port of New Orleans Place. A cheaper alternative to the official garages is the Fulton Street Garage. It is only a few minutes away and has a shuttle to move you and your luggage to and from the port. Driving directions for the New Orleans cruise terminals: I-10 to US90 West. Take exit 11C (Tchoupitoulas Street/St. Peter Street). Turn right onto Tchoupitoulas Street. Turn left at Henderson Street. Turn left onto Port of New Orleans Place. Follow the signs to your terminal.